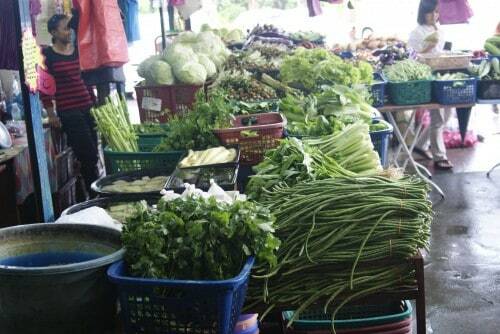 Have you heard about Langkawi wet markets? Unless you’re a cruising sailor and well versed in Southeast Asian produce or have some previous island life experience; shopping for food on some islands can often be challenging. Learning about local produce and their uses is a cultural experience you simply don’t get from a book, so the reward for your efforts can bring useful knowledge for the future and some interesting memories. 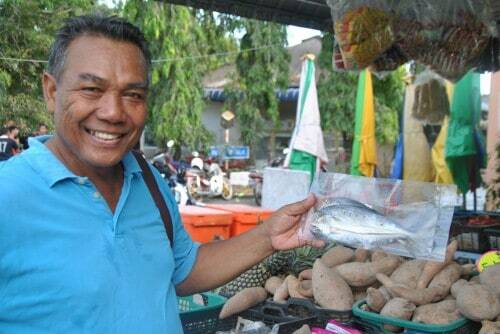 Fauna Flora Eco, tour guide Abidin Hussin, my wet market guru. Being rather spoiled with the plethora of produce options in high-end metropolitan supermarkets, new arrivals to island life may find there’s a price to pay for those now-considered-imported- food items. But guess what? You can often find their equivalent at the local wet market at a considerable savings. Whether you migrate to Langkawi permanently or take extended holidays here, wet market knowledge is king. At some wet markets you may find yourself the only ‘foreigner’ in a sea of ‘local’ faces, but that’s part of the adventure. And often times market venders will gladly introduce you to their produce and their uses, so keep a notepad with you and take notes because this is priceless information! 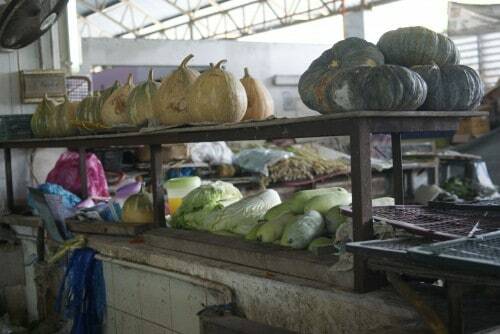 This Matsirat wet market stall specializes in local and ‘imported’ fruits. Some first time visitors to a wet market may find meat and produce presentation disturbing, but remember these methods have lasted the test of time and many generations. Eggs being stored on non-refrigerated shelves? Sure you’ll get an occasional bad egg, but you’ll not find a more beautiful natural colored or flavorful yolk as with local fresh eggs. Prefer organic chicken? Well you haven’t tasted chicken until you’ve tasted Langkawi free-range and at a fraction of the price! Yes, they’ll remove the feet for you free of charge! Now, when it comes to vegetables, you’ll recognize plenty of your old favorites from back ‘home’, but you may not always see what you need for a particular favorite recipe. You may see vegetables that look similar, but are they? There are also vegetables that look nothing like their western counterpart, but cook and taste the same. Squashes, gourds and melons lead the way in culinary mystery, often labeled under the general name of Labu. Labu merah looks like a large Acorn Squash but is your equivalent to Pumpkin, while a smaller ‘pumpkin-looking’ version is identical to Acorn Squash in cooking and taste. There are a myriad of leafy greens available including Bok Choy, Kai Lan and even Spinach (bayam). 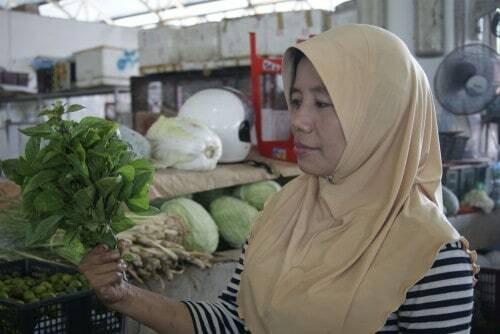 Bayam, which is identified by its red stem, cooks and tastes like spinach, at a fraction of the price of imported English Spinach. It doesn’t need refrigeration either if the stems are placed in water. The one ringgit Basil bouquet. 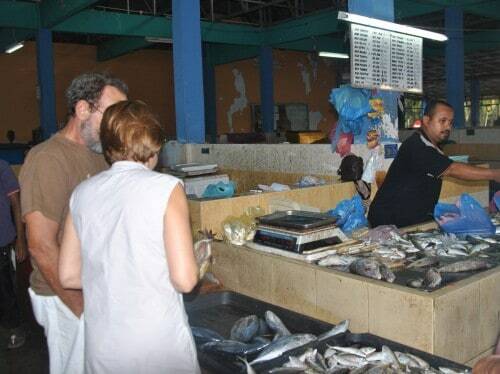 When it comes to meats and fish, you’ll not find a better retail bargain than at the wet market. 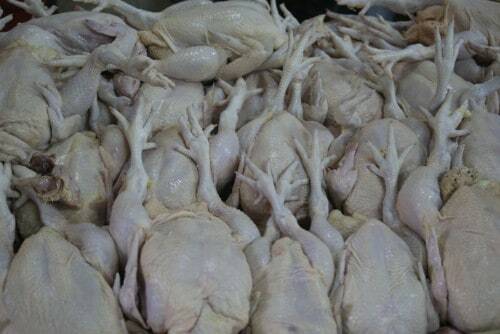 A whole chicken (ayam) will cost you an average 12 ringgit. Usually feet and head removal is free as is the additional ‘chopping’ or halving. Fish are a bit trickier, because some locals actually prefer the taste of older seafood. As a westerner, I prefer shopping for the freshest. This couple seemed to have wet market savvy. Some say the redder the gills the fresher the fish, so possibly a better indicator than the clear versus filmy eyes. 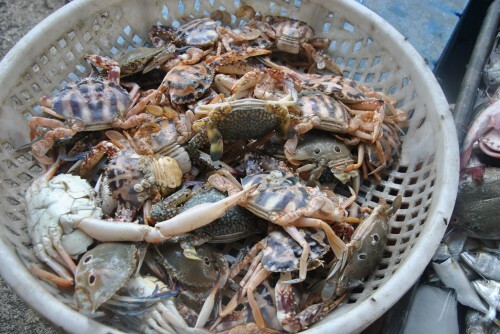 Fish and shrimp generally go for 5-10 ringgit a kilo, clams 5 ringgit a kilo and crabs 20 ringgit a kilo. Again a simple request and a little pantomiming, if language is an issue, can usually get your fish cleaned for free. Tasty local crabs are a great bargain. 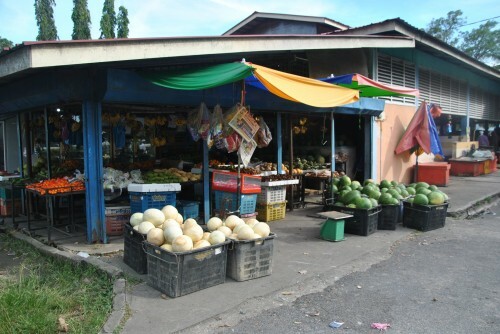 There are two major wet markets in Langkawi. One is in Matsirat, near the airport and the larger one is in Kuah. They usually open early mornings and again late afternoons, with variations depending on public holidays. If you’re new to the area of wet market shopping I’d recommend a wet market tour, either by a Langkawi local or a professional tour guide. Two recommended sources for that would be Fauna Flora Eco Tours and Dev’s Adventure Tours, where you’ll get more in depth information. Remember wet market knowledge is king! Do you shop at wet markets while traveling? Any good tips for newbies? When is the good time to buy seafood? Morning or evening? I read from somewhere which said the fresh seafood usually ship to the wet market in thr evening. over at Langkawi. Do you think that id right? I’ve also heard tell that Wednesdays are when special produce from the mainland arrives. I’ve seen some gorgeous veggies being delivered. The schedule is not the same if it happens to be a holiday week. Go early for the best selections. Is there any chance to get fresh mutton? Did you try Hegner’s? It’s in Kuala Muda near the Bella Vista Hotel on Jalan Kuala Muda.. I visited the web site you mentioned. Though i would visit but the web page shows as they may have only frozen meat…i will check if fresh mutton is there. If you are in Langkawi you should go see them in person. It is possible that they also do special orders for area hotels.